I have dyed eggs this way since I was a little girl. My grandparents lived in Switzerland, in a chalet overlooking Lake Brienz. It was a place straight out of a storybook and I have many Heidi memories, running up mountains and down steep meadows with cows in the field nearby, an isolated chalet in the distance, and the Alps all around. 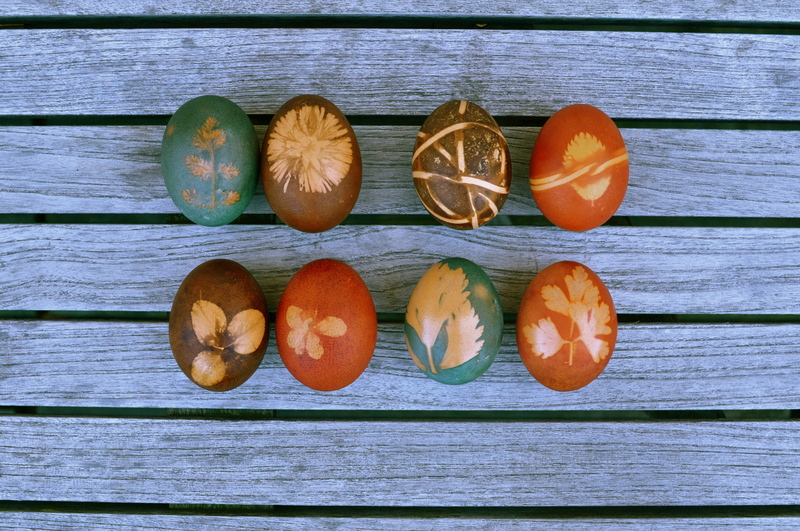 Sweet summer smells of sunshine and succulents can conjure up those memories unexpectedly, but I sometimes invoke them willfully, through rituals like these: every year for Easter I dye eggs with leaf patterns, as we used to do. In Switzerland we easily found natural dyes at the pharmacy (they are still readily available): walnut husks for deep brown, dried mallow petals for blues, and all sorts of bark for various hues of yellow, orange, and red. But here in New York I’ve been compelled to use everyday ingredients, fruits and vegetables — even better! If only they’d worked. For years I was woefully unsuccessful with all vegetable dyes except onion skins, which are brilliantly reliable and produce a stunning deep brick red. I was on the verge of writing off all other colors, had I not recently been taunted by blogs and photos posting deep-hued eggs tinted with spinach, turmeric, red cabbage… Why not me? I’d been using the wrong method. During all those years of stubbornly prepared and pitifully useless homemade dyes I had followed the instructions remembered from the little Swiss packets: hard-boil the eggs for 12 to 15 minutes directly in the colored liquid. This did work with onion skins but other vegetables left no trace on the shells whatsoever. Determined to get something out of my cabbage after all (and wised-up by some online reading) this time I waited for the liquid to cool, plunged the already hard-boiled eggs into the dye, and left them in the refrigerator overnight. Magic! This time I made the experiment with red cabbage only, but I know it is the way to success, and I see a bright multi-colored Easter-egg future ahead. Prepare the dyes in two medium saucepans: about 8 cups of cold water for 2 cups of onion skins and about 6 cups of cold water for 3 cups of shredded red cabbage. Bring to a boil and simmer gently for about 30 minutes. Let cool. Meanwhile hard-boil the eggs: bring a large saucepan of water to boil, gently place the eggs inside, and simmer gently for 12 minutes. Run immediately under cold water. 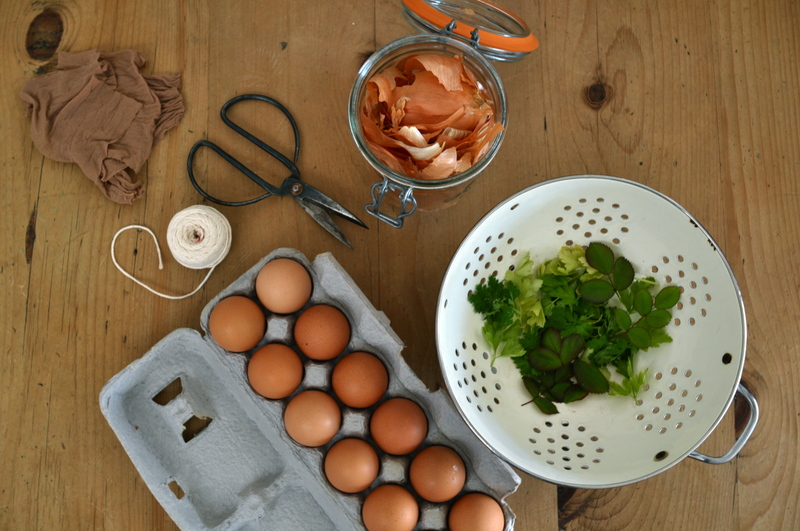 Let dry and gently rub the eggs with a little white vinegar. Cut the stockings into 3-inch (8-cm) squares approximately. Place the eggs in large jars, pour the cold dye over the eggs, and leave in the refrigerator until the egg acquires the desired hue (this can take anywhere from a few hours to a day, as desired). Once the eggs are dry, rub with a little oil for shine. This entry was posted on 28 March 2013 at 09:39 and is filed under Easter, Eggs. You can follow any responses to this entry through the RSS 2.0 feed. You can skip to the end and leave a response. Pinging is currently not allowed. I have done this and the outcome is spectacular. Beautiful! How do you prepare the walnut dye? and in what amounts? Beautiful! 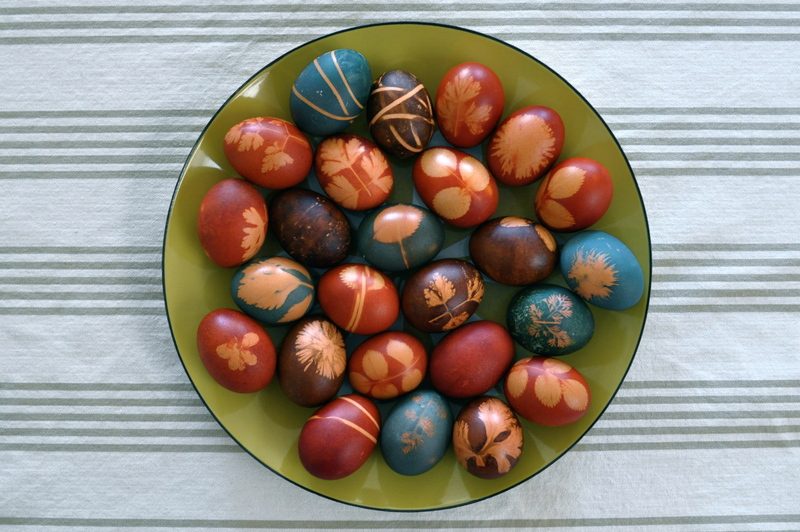 !….a great way of decorating eggs. Thank you, and fun too. I came here through your mom’s introduction on FB. You are such a talented cook and an artist too! 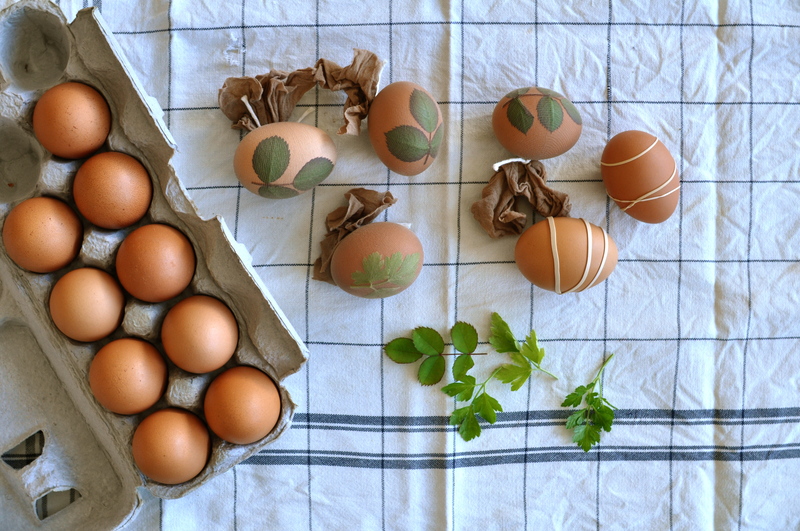 I just love the look of these eggs… very rustic yet chic at the same time :-) I love the fact that you use natural dyes. Happy Easter! Thank you so much, Louisa, and happy Easter to you too!